Seen in the manga and OVA as Joker's office secretary and junior agent of British Library Special Operations, she now serves as his right hand henchwoman. Wendy's character has matured radically, from an enthusiastic, if clumsy, over-eager young assistant into a serious, ruthless agent willing to fulfill the B.L. 's plans by any means necessary. She is highly resentful of Yomiko (whereas she adored her in the manga), likely due to events laid out through the course of the TV series, and she is one of the few B.L. personnel fully aware of Joker's plans. A half-Indian, half-English girl. She joins the Special Operations Division young (aged 19), and soon becomes Joker's personal secretary. She still has the subfix in training after her work title. She is earnest, devoted, and hopelessly clumsy. 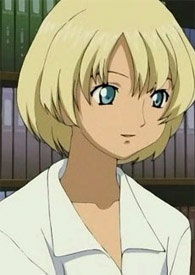 In the OVA, she is found to be more of a misplaced school-girl than an actual employee under the British Library; yet, in the Anime series, she is found to be more emotionally stable and serious about her work. At one point, she has Yomiko and the Paper Sisters at gun point; an action she is subliminally found to be incapable of performing in the OVA. What adds to this dramatic change is that she is also placed as head of a tactical squad at the same time in the gun-point incident, which suggests that she has also become more understanding of her own capabilities. In the novel, she was even once tricked by Joker to wear a French maid outfit to send message of Joker to Yomiko.